Kevin-Prince and Jerome Boateng (l-r.) are set to meet on opposing sides in the Bundesliga on Matchday 15. 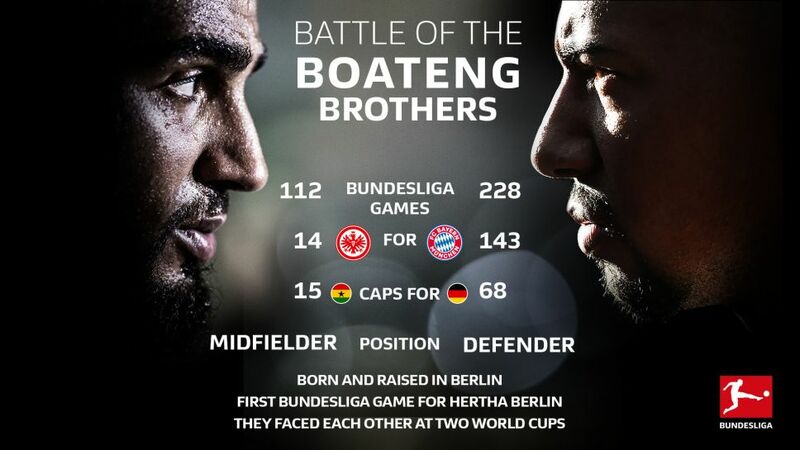 United by blood, divided by football: Jerome and Kevin-Prince Boateng are set to meet on the field once again this weekend as the half-brothers prepare for battle in the Bundesliga. It will be the sixth time the two Berlin-born internationals have met on the field, the fourth in the Bundesliga, and Kevin-Prince can level the record at two wins each if Eintracht Frankfurt can get the better of Bayern Munich this Saturday. It would complete a productive week for the 30-year-old, who struck a fine goal at his ex-club Hertha Berlin last weekend and on Thursday picked up a prize recognising his work in fighting racism in football, and his club. Ten points separate the two sides in the standings with Frankfurt, down in eighth, keen to kick on after losing just one of their last eight – unsurprisingly on home soil, given that the 15 points they have picked up on their travels this season are more than any other side, including their guests (13). Kevin-Prince's contribution is not negligible either. Since arriving from Las Palmas in the summer, he has ultimately shred the bad-boy image from the early days of his career and showed a level of maturity that has made him a role model, on and off the field; a player and figure his younger team-mates look to for inspiration. He may not have the trophies of his half-brother, who can count five Bundesliga titles, three DFB Cups, a UEFA Champions League and FIFA Club World Cup as part of his collection, in addition to a FIFA World Cup and Germany's 2016 Footballer of the Year award, but with an Italian Serie A Scudetto and an English League Cup winners' medal, the much-travelled Kevin-Prince's trophy cabinet is certainly not bare. When they meet this Saturday, though, the prize will be three points, with Bayern eyeing the unofficial autumn champions' prize with a few weeks to spare and Frankfurt keen to push on into the top six. A repeat of the last meeting of the Boatengs – a 1-1 draw in February 2015, when Kevin-Prince bore the blue of Schalke and Jerome received the red of the referee's wrath – would ensure no family feud. Either way, it will end with a shake of the hand and a family get-together in Frankfurt, after two brothers meet again in the Bundesliga. Click here for the Eintracht Frankfurt vs. Bayern Munich Match Centre!